Conal Keaney’s injury proved a watershed moment in a thrilling second half. Kilkenny's Walter Walsh with Eoghan O'Connell and Alan Nolan of Dublin. LIAM BLANCHFIELD POPPED up with a dramatic injury-time match-winning goal to secure a memorable Leinster SHC Round 1 win for National League champions Kilkenny. Pat Gilroy’s new look Dublin, with former All-Star defender Liam Rushe running amok at full-forward, looked all set for a famous win when they led by five points with five minutes to go. They were also superbly led by veteran Conal Keaney who returned from retirement for this season and scored four points from play. But Keaney was taken off with a worrying shoulder injury with 10 minutes to go and Dublin’s fortunes nosedived in tandem during the closing period. They still led entering injury-time but Kilkenny had vital momentum at that stage and Blanchfield’s fine solo goal in the 71st minute ultimately tipped the balance. Kilkenny outscored Dublin by 1-5 to 0-1 in all during the closing stages to secure the battling two-point win and will move on now to play Offaly in Round 2. TJ Reid top scored for Kilkenny again with 12 points though Cody has plenty of thinking to do ahead of the Offaly game. Paul Murphy and Colin Fennelly, just back from army duty, came on and were both influential while Blanchfield clearly had a major impact when he came on too. Dublin’s goals will also concern Cody as the hosts got three of them with two arriving in the first-half to leave Gilroy’s men 2-7 to 0-9 up at half-time. Rushe was terrific at full-forward and created both goals, the first for Paul Ryan after three minutes and the second for Fergal Whitely approaching the interval. Rushe also used his power and industry to win frees that Ryan converted. Rushe and Ryan played in a two-man full-forward line for Dublin with Jake Malone dropping back to midfield, freeing Sean Moran to operate as a sweeper. It worked a treat and Kilkenny scored just three times from open play in the first-half. Eoghan O’Donnell, Dublin’s regular full-back, played at centre-back and marked both Reid and Walter Walsh throughout the contest. Kilkenny had the wind in the second-half but Dublin continued to impress and picked off some excellent scores to open up a five-point lead with 65 minutes played, 3-15 to 0-19. Dublin subs Tomas Connolly, Fiontan MacGib and Paul Winters all picked off second-half points and Chris Crummey drilled over a beauty to leave them within touching distance of winning, five clear. But Kilkenny brought all their big game experience to bear on the closing stages and pulled it out of the fire with points from Reid, Eoin Murphy, Fennelly and that excellent Blanchfield goal. Scorers for Kilkenny: TJ Reid 0-12 (0-8f, 0-2 65), Eoin Murphy 0-4 (0-4f), Liam Blanchfield 1-0, Colin Fennelly 0-3, Walter Walsh 0-2, James Maher 0-2, John Donnelly 0-1. Scorers for Dublin: Paul Ryan 1-6 (0-5f), Conal Keaney 0-4, Fergal Whitely 1-0, Jake Malone 1-0, Paul Winters 0-03 (0-02f), Tomas Connolly 0-1, Fiontan MacGib 0-1, Chris Crummey 0-1. KILKENNY: Eoin Murphy; Joey Holden, Padraig Walsh, Paddy Deegan; Conor Delaney, Cillian Buckley, Enda Morrissey; Richie Leahy, James Maher; Martin Keoghan, TJ Reid, John Donnelly; Bill Sheehan, Walter Walsh, Ger Aylward. Subs: Colin Fennelly for Sheehan (33), Conor Fogarty for Keoghan (h/t), Paul Murphy for Morrissey (46), Liam Blanchfield for Leahy (55), Luke Scanlon for Aylward (59). DUBLIN: Alan Nolan; Paddy Smyth, Cian O’Callaghan, Bill O’Carroll; Sean Moran; Chris Crummey, Eoghan O’Donnell, Shane Barrett; Jake Malone, Rian McBride; Danny Sutcliffe, Conal Keaney, Fergal Whitely; Liam Rushe, Paul Ryan. Subs: Fiontan MacGib for Sutcliffe (38-39), Paul Winters for Ryan (46), Tomas Connolly for McBride (53), Ryan O’Dwyer for Keaney (60), Shane Durkin for Malone (66). 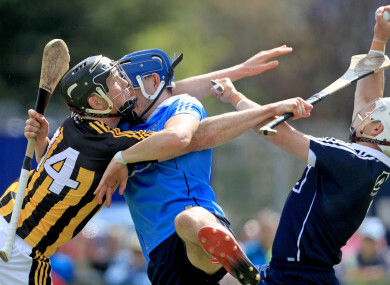 Email “Kilkenny clinch dramatic win as Pat Gilroy's Dubs leave it behind them at Parnell Park ”. Feedback on “Kilkenny clinch dramatic win as Pat Gilroy's Dubs leave it behind them at Parnell Park ”.